We’ve all heard the old adage ‘You can’t teach an old dog new tricks,’ well happily this isn’t true. The only difference between crate training a puppy and crate training an adult dog is that you will need to allow a little more time. Training your dog to use a crate has many advantages. Dogs are den animals by nature; they need to have the security of a space of their own where they can escape from the hubbub around them when the house is full, or retire to after a good long walk. Used properly, a crate can provide just that; but your dog needs to be introduced gently and slowly to fully appreciate his crate. It is very important to make sure you have the right size crate for your dog. If the crate is too small it would be inhumane, too large and it loses the den-like feeling of safety and security that a dog is looking for. So your crate needs to be large enough for him to stand up and turn around easily, and stretch out comfortably when lying down. Position your crate in a quiet corner of a room where you and the family spend a lot of time, perhaps the kitchen/diner or living room. It’s important that your dog won’t feel isolated. Put comfortable bedding in the crate, a blanket or crate bed on the base, maybe a blanket from his normal dog bed so there is something familiar and comforting in the crate. Either remove or secure the crate door open so that there is no danger that the door closing behind him and scaring him. Crate training an adult dog can take days or weeks depending on your dog’s temperament and past experiences; if your dog is a rescue dog, he could have had some bad experiences, so you need to be patient and never force him. To successfully crate train an adult dog, the training needs to be taken slowly, one step at a time; he needs to associate his crate with positive emotions. Always praise and encourage him every step of the way. Leave the crate in the room for 24 hours to let your dog get used to this new item of furniture, and allow his natural curiosity to take over. 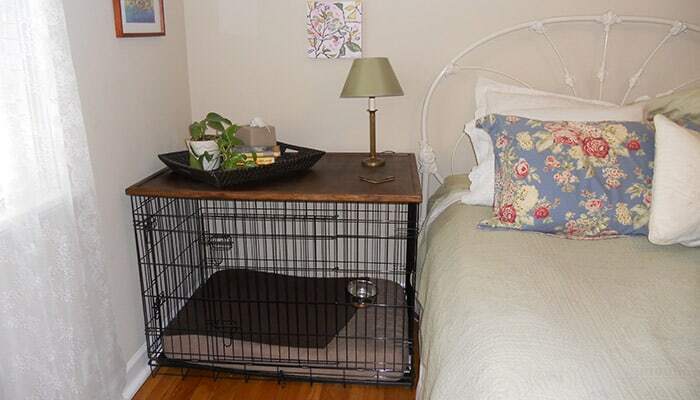 Some dogs will take to the crate immediately and curl up in it happily. If yours isn’t one of those, then you will need to slowly encourage him. To encourage your dog to venture into the crate, place some of his favorite treats by the entrance, then just inside the crate, and gradually right to the back. If he doesn’t want to go right in, don’t force him. You can try playing with his favorite toy, and then putting that in the crate. Always encourage and praise as he ventures further inside. Once your dog is happily going in and out of the crate, move on to step 2. Once your dog has accepted the crate, start feeding him his meals with the bowl at the back of the crate. If he is still anxious about going right inside, start with the bowl just inside the entrance, then gradually move the bowl further in with each meal until he is happily eating with the bowl right at the back. Be sure to clip the door open, as if the door closes on him in the very beginning, it can spook him and set him back a few steps. Once your dog is happily entering the crate at mealtimes, you can then close the door while he is eating. Initially open the door as soon as he has finished. With each meal leave the door closed a little longer until he is staying in his crate for 10 to 20 minutes after finishing his food. If during this process your dog starts to whine or bark, it could be you have increased the length of time too quickly, so reduce the time you keep the door closed for a few meals before extending it again – very gradually. 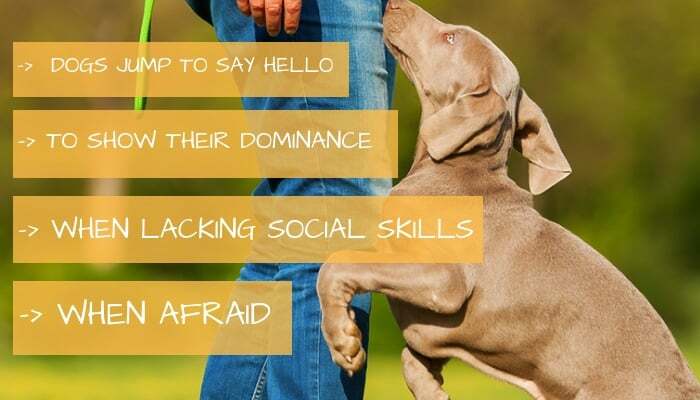 If your dog does whine or bark, it is important not to let him out immediately, speak calmly and reassuringly to him, wait for even a brief gap in his whining before letting him out. Ignore him. If you look at him or talk to him, he’s getting attention. You don’t want him to associate whining and barking with being let out. This is a mistake that many dog owners make. Once your dog is happy to eat his meals in the crate and to stay in for a period of time after he has eaten, you can start training him to stay in the crate for short periods at other times. Call him over to the crate with a treat in your hand, and indicate to enter, introduce a command, ‘in your bed,’ ‘crate,’ ‘kennel.’ Give him a treat and make a fuss of him when he goes in. Then close the door and give him another treat. Sit close by the crate for five to ten minutes then go into another room for a minute or two, then return and sit down close by for a few more minutes. Then let him out of the crate, and praise him. Repeat this process several times a day, gradually increasing the length of time you are out of sight, and extending the length of time he is in the crate. Once he is content to spend half an hour or more in the crate with you out of sight, he is ready to be left in there while you go out for short periods of time. Now your dog is content to be left in his crate for longer periods of time, you are free to go off and do a few errands, but don’t be gone for too long to begin with. Remember you need to take things slowly otherwise your dog could develop separation anxiety issues. It is also advisable as a safety measure to remove his collar while he is alone in his crate, in case it was to get caught in the mesh. Call him over to the crate using your usual command, and give him a treat and praise him. Close the crate door as usual, and give him another treat. Make sure he has a bowl of fresh water in the crate. It might be an idea, if you aren’t already doing so, to leave a couple of safe toys or a chew, to occupy him in your absence. Get ready to leave, don’t make a fuss or prolong your departure. He is quite happy to be in the crate if you make a fuss you could cause excitement or anxiety. When you return, it is important not to make a big fuss of him. Be calm and matter-of-fact. Let him out in the usual fashion. If you greet him in an excited, over-enthusiastic way, he will become overexcited every time he is left. Once you have started to crate your dog when you go out, make sure you also use the crate occasionally when you are home; otherwise, he will only associate the crate with you leaving him. Remember, for him to continue to be content when crated, he needs to associate it with good things. Crating overnight is sometimes a necessity if your dog is sick, or injured – and requires crate rest. While we don’t encourage long crating times, it is worth training them to accept this just in case an emergency does occur whereby it becomes a necessity. When crating your dog overnight, it is advisable to move his crate either into your bedroom or on the landing outside to begin with, so he doesn’t feel isolated, and also so you can hear if he gets distressed or needs to go outside. Use your usual command word to call him into the crate, and give him his treat before closing the door. In the morning when you let him out, don’t make a huge fuss. When crate training an adult dog, you need to allow him enough time to become comfortable and confident in and around his crate. Older dogs need more time to take on board new behaviors, and also can forget, so repetition is important. If you send your dog to the crate as a punishment, you will be undoing all the training. For your dog to be relaxed and feel secure and content in his crate he needs to associate it with his favorite things – treats, toys and rest. If it is used as a punishment, he could become afraid, and it would see being confined in the crate as a punishment every time. A dog should never be crated for more than 4 hours without a break, shorter periods for puppies and elderly dogs. A dog needs to be exercised and allowed to relieve himself. Being crated for long periods of time can cause distress, especially if the dog soils his bedding. Dogs are sociable, energetic animals and prolonged periods spent on their own can cause psychological problems. There is a difference between a dog letting you know he needs to go out to relieve himself, and a dog attention seeking. If you give in to your dog when he creates a fuss, he will continue to do so. You have to ignore him; don’t speak to or look at him. When he goes quiet, then he can come out. Crate training an adult dog doesn’t have to take all the time in the world, and can even be a great experience that allows you to bond with the new fluffy member of your family, and why not multitask; grab a cup of tea, or glass of wine – and finally get around to reading that book you’ve been wanting to start while you wait for the allotted crate time to pass?! Nadia is a specialist canine writer hailing from England. With over ten years of experience in training, and rehabilitating canines. She is well known for her easy to read dog training articles and books!